This is a Birdguides 'Notable Photo'! 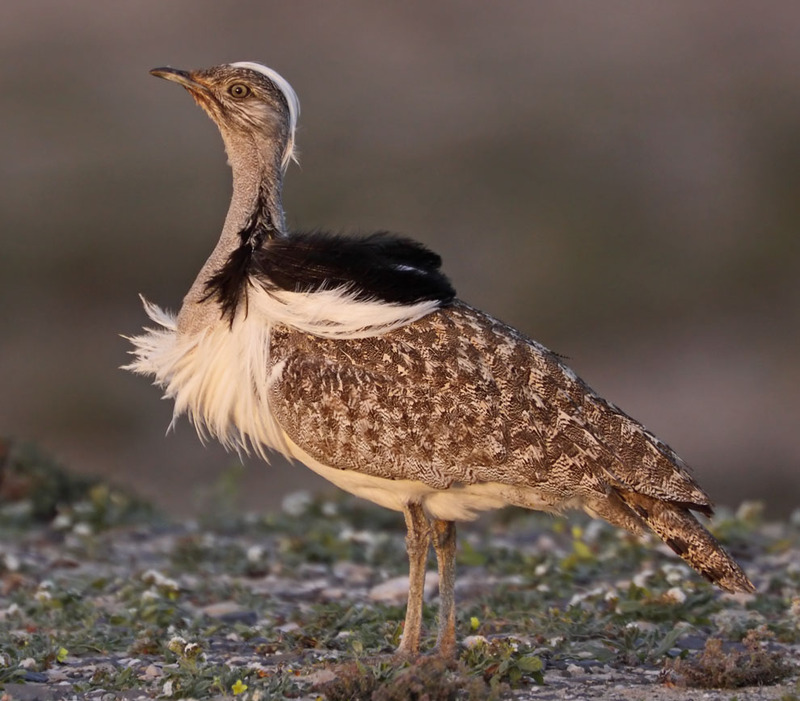 Prior to this trip, I had re-read with interest an account by Richard Brooks in Birding World from 2006, in which he described a trip to Fuerteventura where he found and photographed a Houbara Bustard from a car at close range. Surely though we wouldn't be so lucky?! On this week long trip to Fuerteventura we had already been fortunate enough to see three of these splendid birds, but only very distantly - no good for photography. For our last three days we stayed in Costa Calma which allowed a couple of early morning visits to the nearby plains. On the first morning I was up on a pre-dawn prowl first looking unsuccessfully for sandgrouse at La Pared. But driving along a track in the same general area I came across a strange dull silver car with blanked out windows. Moments later I spotted 2 large lenses protruding from the other side. I then saw what they were interested in – a displaying Houbara Bustard right by the track! Despite my bright red car without any window blanking, this splendid bird tolerated a close approach and I managed to get some quite reasonable shots. However the conditions that morning were dull and the photos lacked contrast.